Your mistakes in branding trickle down and stain your reputation, hopes and dreams won’t save the day. You have to want to see the brand represented with quality and consistency, and with the highest level of consideration you can afford to bring into the endeavor. Many company leaders take it upon themselves to make decisions on style, and fonts, and even nuances of an illustration. It’s good to be involved in the direction of everything, but risky to take the reigns on. See our handy Fibonacci inspired chart of designer and client decisions vs cost summary. When set to the task of brand building or brand maintenance, you must ask yourself one question, and be very honest… are you a Graphic Designer? if you answered yes, then use the list below as a quick measure to see that you’ve addressed at least the first 5 on the big list. If you answered no, then you need to read this article to the bottom, and consider the advice as critical to staying out of the gutter, aesthetically. Don’t go it alone, having the talent and understanding of a veteran designer is a must. As a key decision maker in your company, you should know that you are not an expert in everything business. Know your strengths, and leverage the strength of others, hold the bar of excellence as high as you can afford. Here is the a list of the top 5 pain points that can be avoided by learning, and leaning on an expert. (1) Not taking the time to craft a well designed logo. 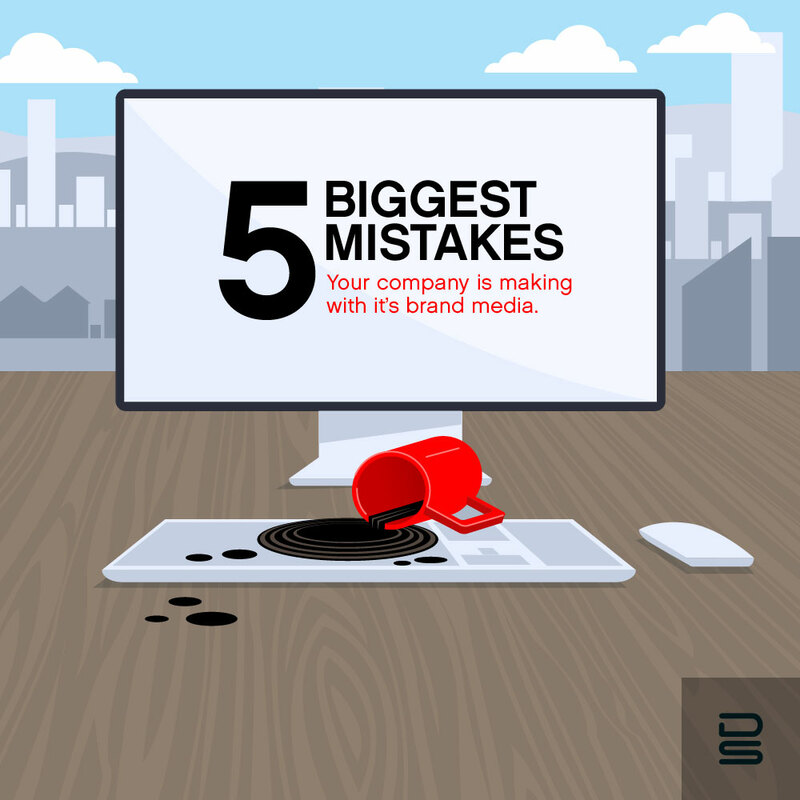 The most important visual component of your company’s first impression is your logo mark. Period. It doesn’t have to be flashy, but it ought to be well curated. Making sure you don’t impersonate another entity, or design something that doesn’t relate are both great pitfalls every company should avoid. From sloppy line work, to incoherent ideas, to overly complex details, we’ve all seen bad logos take flight and ruin brands that could have been really great. Your great idea should be complimented with a great logo. Don’t settle, take your time to get the right design and don’t stop searching and creating until you find it. Try to find a well established graphic designer or get with an agency that has a history of great graphics. The rest is up to your own vision on what style and impression you want your logo mark to contain. (2) Not showing your logo mark in a controlled way. Controlling the way that a logo is used is for sure the next level down of importance. Once you have a killer logo, you then need to make sure 3rd parties and print/web publishers don’t bastardize it’s look, by rendering it again in the wrong way themselves, or flipping it into other coloring and/or un-approved layouts. The worst pitfall is usually just inaccurate color tones, which can take a great impression, and immediately downgrade it to a disappointed impression. Show only your best version of the logo mark. It should be razor sharp, and always displayed in the way the design was intended. Ask your branding team to build you a brand bible, so that you can share it with vendors and work colleagues, and they can learn the way it needs to be displayed for maximum consistency. It can go Portrait or landscape gloriously, but don’t mess with the design laid down by your brand experts. (3) Not putting your logo on everything you release. When sharing a photo or a work of any kind, there really should always be some kind of watermark or brand stamp associated with it. Next time you want to post to social media, take some time to get your image collection watermarked using your favorite image editing app, or something the professionals use like adobe photoshop. Ask your graphic designer for a transparent version of the logo mark in either white or black. Then use which ever looks best. Photos are among the most traveled files on the web. Make sure you stamp yours so that those open image searches in some way point back to the entity that owns them. You never know when that could turn into a solid lead, or collaboration with in your industry. (4) Not giving your employees the proper email signature graphic. “Dear Mr. Client, I really want your business, and we do great work, but we can’t seem to get our email signatures in place, and so you may or may not know who is sending you this note. Send me another note back to ask for phone number. But also, if you notice that my company’s logo is pixelated or misaligned or really big, it’s because I saved it in word, then compressed it in MS paint, then put it back into word and saved it out as a .JPG for the web.” – Employee B. Enough parody, please ask your designer for a web optimized and email ready signature graphic file. It should be sized just right, and given to all employees who send email on the company’s behalf. (5) Not giving your employees the proper white papers graphic file. This again another pitfall companies make when using their logo mark. They use web quality graphics for printed pieces causing blurry and disappointing first impressions. Always use vector format.PDF or print quality .JPGs for printed media. Make sure your team has copies of each version of these files. If you don’t have a full print set of your logo mark, ask your graphic designer for a set of files. Envelopes, letterheads, business cards, t-shirts, vehicle decals, etc. Each ought to be their own sizes and featured in controlled and consistent brand colors. Good luck on your road to broadcasting your brand with great care and control. For a complimentary consultation contact us, for either new design, a redesign, or a brand alley-oop to keep going with that killer something you’ve already got.